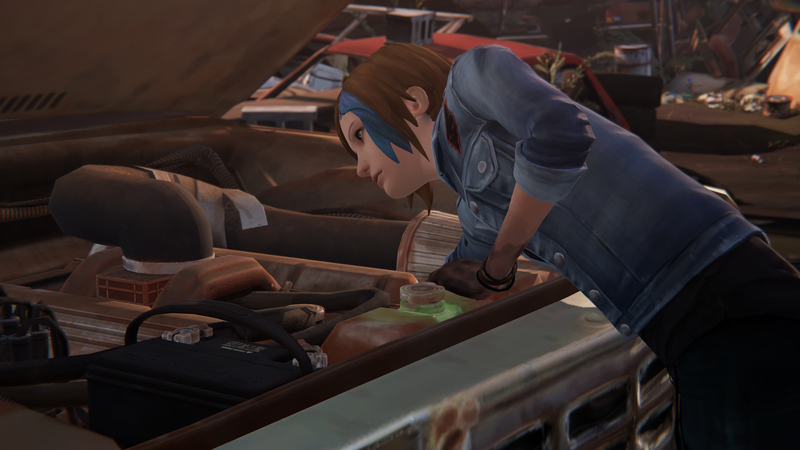 This exchange between Chloe Price and a vision of her late father, early in the third episode of Life is Strange: Before the Storm, cuts right to the heart of Deck Nine’s prequel mini-series. The motif of theatre has been a constant since the series premiere, and even though Blackwell Academy’s performance of The Tempest is done and dusted before this episode begins, theatre remains central to Before the Storm—at least in what it represents. Like I said previously, this game is all about the performance of being a teenager: the changing masks, and the conflict between the “real” self and the one we present to those around us. The Chloe that Rachel Amber sees isn’t the same Chloe that Joyce Price (Chloe’s mother) sees, neither of which is the Chloe that drug dealer Frank sees, none of which is the Chloe that David Madsen or Principal Wells sees. The costume that Rachel wears when she’s with Chloe isn’t the same as the one she wears around her parents, or among classmates at school. Juggling all these different personas, as every person does, how can one know which one is the real you? What if the life you live while wearing a mask is a better one than your “true” self? Is there even such a thing as a “true self”? Figuring out how to answer such questions—though, in all likelihood, not finding the answers themselves—is a big part of adolescence, so it’s only right that a teen coming-of-age drama should explore them. The use of theatre imagery asks those questions in a potent, enchanting way. Before the Storm‘s finale, “Hell is Empty”, moves away from the stage, instead focusing on the theatre of real life. 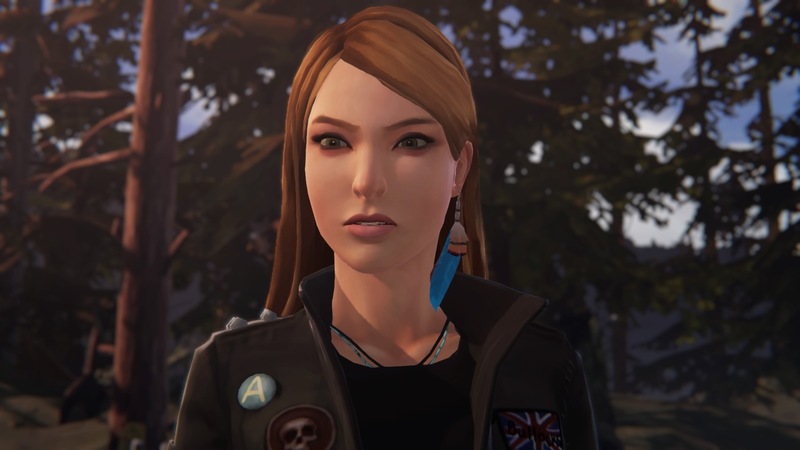 The episode focuses on an unravelling web of lies surrounding Rachel Amber’s family, some of which Rachel herself is privy to, some that she’s not, before giving you a choice: tell her everything, giving her the truth but destroying the illusion of a happy, “normal” family, or let her continue living in relatively blissful ignorance? What’s worse, a home that’s more or less happy and more or less stable but built on fiction, or knowing the truth at the cost of that? What’s better, the real or the theatrical? The stakes of such a question are built heavily into Before the Storm‘s final choice—which asks that question in about as literal a way as possible—but it pervades the entirety of “Hell is Empty”. Earlier in the episode, as she’s trying to deal with the discovery that Rachel’s dad’s been lying for years, Chloe’s given pause to wonder if her own idyllic memories of life with her father were “real”, or if they too were a theatrical performance. Would she even want to know the answer? This is Before the Storm at its most powerful. Setting aside the drama surrounding Frank and his drug dealer buddies (which drives much of the latter part of the episode), this is a game that about the theatricality inherent in life, for better or worse, and the difficulty of navigating that stage as a teenager. What I hadn’t realised until I went back to the first two episodes in search of collectibles is just how present this theme is across the board. 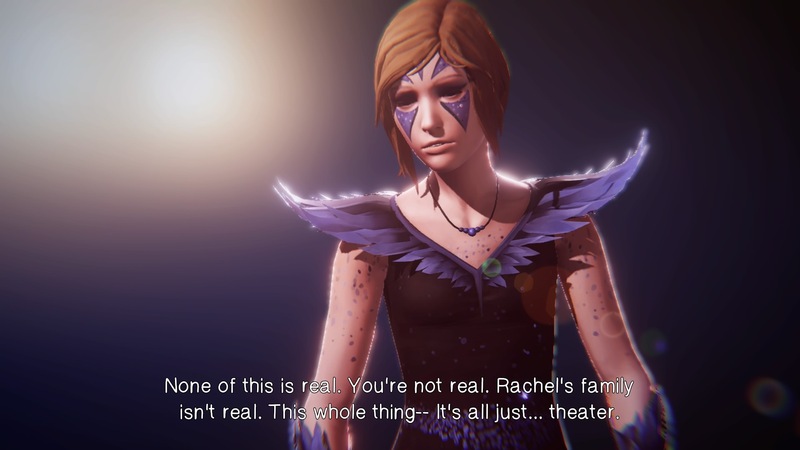 It’s right there in the fundamental mechanics of the game: with every dialogue choice, you’re creating your own Chloe mask; you’re on stage, playing the role of this troubled teen, and trying to figure out what sort of performance each situation needs. It’s there in that seemingly idle moment where you’re playing dungeons and dragons with Steph and Mikey—role-playing in a literal sense, but also another kind of performance. It’s there in the “backtalk” mechanic, which has Chloe engaging in a sort of snark-charged improv battle with another character in an effort to get her way or impose her will. It’s there in those moments when you get to choose Chloe’s outfit; what in most games is something purely superficial becomes a potent metaphor here. It’s even there in this game’s take on collectibles: graffiti spots, most of which give a choice of what to draw, in turn emphasising the persona that you’d have Chloe wear in that moment. It’s refreshing to see such a clever marriage of theme and game design. 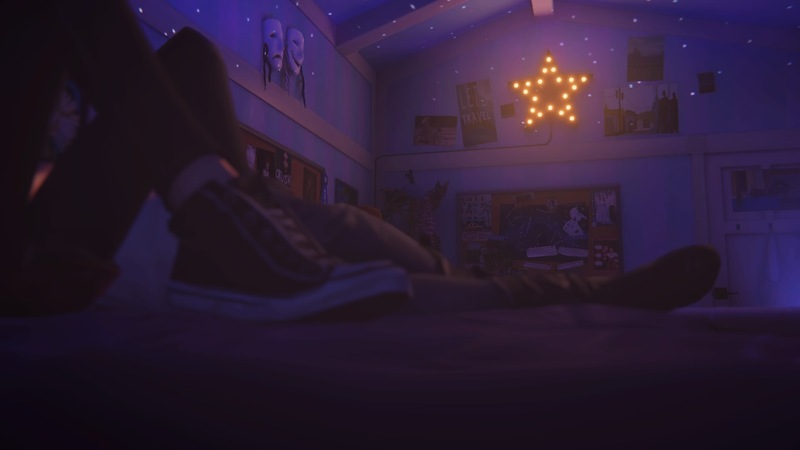 In keeping with its source material, Before the Storm is also a game about determinism—more specifically, every teenager’s fight to carve their own path in a life that often seems like it’s already set in stone. The very first scene in the first episode has Chloe standing on a railroad, in the headlights of an oncoming train, only to casually jump out of the way at the last second. Trains played a major role in the original Life is Strange, representative as they are of determinism. That imagery continues here, but from the perspective of someone looking for a way to break free of those tracks. This is why Chloe’s effort to restore an old truck she found in the junkyard is so crucial. It’s a means of escape for her and Rachel, both literally—a way to get away from Arcadia Bay and create their own new life together—and figuratively, given its lack of the constraints that trains are beholden to. But to what extent can you actually break away from those deterministic forces? Before the Storm doesn’t ask this as deliberately as Life is Strange does, but it’s still an ever-present undercurrent throughout the game. When you see the subtle impacts of earlier choices—be they your own decisions as a player, or the actions of other characters within the game—you see chaos theory in action. All those questions about identity and performance are their own spin on the conflict between determinism and free will, as Chloe and Rachel find themselves caught between being who they really are and being who everyone else wants them to be, and that all comes to a head in this episode. In other words, “Hell is Empty” is the perfect ending to a stunning series. Lots of people have talked about the sharp writing, great performances, and emotional weight—myself included. That all remains true in episode 3, but that isn’t what makes Before the Storm such a special game. Rather, this game stands out because of its clever exploration of some of the most universal and human questions, made as relatable and compelling as possible through the eyes of Chloe Price and Rachel Amber. Life is Strange: Before the Storm is developed by Deck Nine and published by Square Enix. It’s available now for PlayStation 4 (reviewed), Xbox One, and PC.